I am all nostalgia, for the moment I am in now. My baby girl only braved the water slide if she was firmly in my lap. I obliged a million times, what if this is the last time she wants me? They are growing fast these kids. I am having the urge to MAKE ALL THE MEMORIES. DO ALL THE THINGS. Last night I shaped rice crispies into bird nests, stuck a peep on top. I bought the basket stuffing, the chocolate rabbits. TIme is slipping on me. I want to look it straight in the face. It has not been easy to be Mr. O this week. It has been all trouble and trial; challenge and testing. He has struggled. When my son pulls away hard and we feel him distancing, weakening, we know he is getting discouraged with his very own flesh, the way it fails. I need to learn to be a vessel of hope for him, how do I pour it out all over him when the world has dragged him down? How do I teach him to be his own clay pot? Opening up to the voice of God in his life, the voice of hope over the hopeless? How do I teach him to throw himself back on the potters wheel when the cracks start to show? I am a nurse on a campus. My favorite demographic of humans is people in their early twenties, when they are all fun and hope and laughter. When they are certain they are thinking thoughts nobody ever has, when they have all the authority of a boat not yet rocked. When the world is their oyster, an open clam, and they are all mining the pearls. Tragedy strikes them fiercely, the dark is such a contrast to the light in their eyes. I struggle then too. Darkness just seems so encompassing sometimes. It is Holy Thursday. Today is about the foot washing, the betrayal just on the horizon, the remembering. Today, I think about what Judas wanted. Did he get frustrated with the way Jesus was going about things? Did the messiah not do things his way? Was the world just still too dark? I feel like that sometimes. Sometimes, the church, the bride, is not what I imagined her to be. Jesus doesn’t show up the way I would like him too. You need to watch yourself then, you teeter on trading it all for a lousy bag of cash. 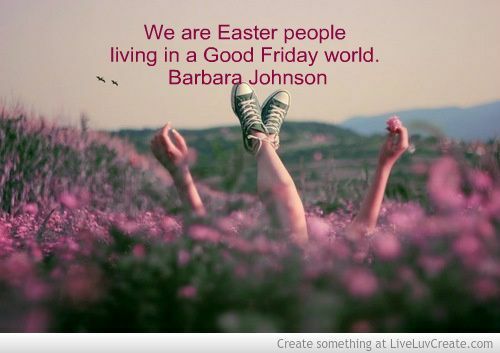 There is very little doubt about the Good Friday world we live in. How easy it is to see the giant boulder there and walk away. Today I am asking God to show me all the stones He is rolling. All the new life he is making. All the Freedom He is giving. Today, I’m asking Him to rise again in my heart, to clear this temple, to make all things new. This entry was posted in FAITH, Mamma Love by melissafed. Bookmark the permalink.